www.stuff.co.nz reported confirmed a bit of news that I have thought should have happened way earlier. 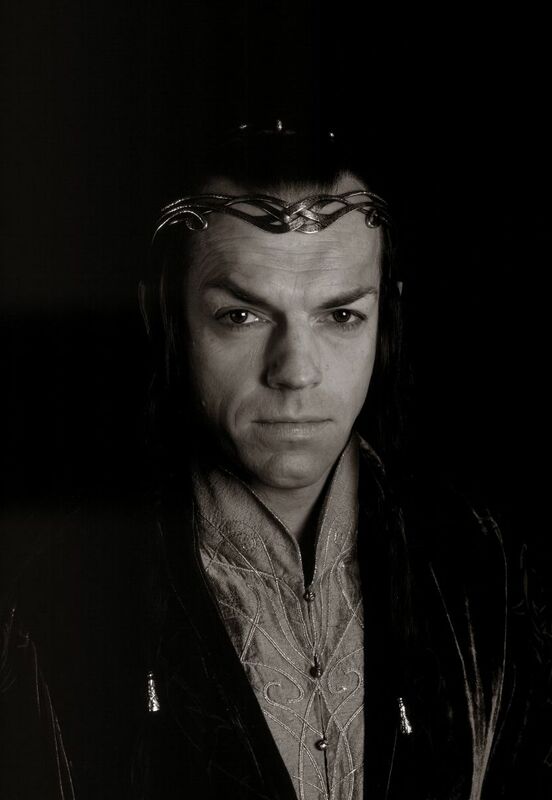 Hugo Weaving will reprise his role as Elrond the elf for the two-part Hobbit movie now being shot in Wellington. The Hobbit spokeswoman Melissa Booth confirmed that Weaving would feature in Jackson’s 3-D prequel to The Lord of the Rings trilogy. The confirmation came after reports circulated that Weaving was spotted in Wellington last week. And Peter Jackson even mentioned the meeting that happened between Weaving and him on his Facebook Page with a snap taken of both of them together [read more on this here]. So naturally, fans knew an announcement was brewing. In June 2009, when Jackson was to be executive producer of The Hobbit, then-director Guillermo del Toro said Weaving would be part of the movie. And now we know he is. Yay again! Jack M., from The Noldor Blog, has reported that Hugo Weaving, who played Lord Elrond in the Lord of the Rings trilogy, was spotted at a shopping arcade. Naturally, speculation is rife as to the reason for his visit. I think it is highly fair to presume that he is in New Zealand to reprise his role of the Elven King. About an hour ago I received news from one of my more reputable spies, and he has reported seeing Hugo Weaving here in Wellington this afternoon, shopping at Common Sense Organics, the fruit and vege market in Wakefield Street. Of course he shops organics – he’s the lord of the Elves, for goodness sake! It’s probably a bit too hasty to assume that he’s here to be in The Hobbit, but I can’t think of any other reason why he would come here right now, just when they’re discussing Rivendell scripts. It’s certainly not for the weather (it’s howling a cold southerly gale out there at the moment). Certainly good news, no matter what! Last heard, Guillermo Del Toro, who was to be director of The Hobbit films, confirmed his intent to again cast Weaving as Elrond of Rivendell in a BBC interview. When asked about reprising the role, Weaving replied that he was game, but hadn’t officially been approached. 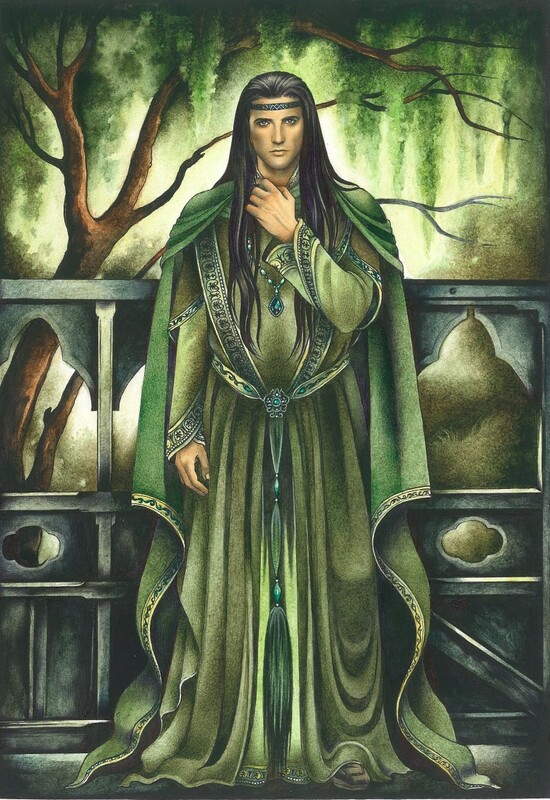 Elrond was Lord of Rivendell, one of the mighty rulers of old that remained in Middle-earth in its Third Age. His name means “Vault of Stars”, “Star-dome”, or “Elf of the Cave” (the exact meaning is uncertain, as Tolkien gave different derivations in different places). He was the son of Eärendil and Elwing, and a great-grandson of Lúthien, born in Beleriand in the First Age, making him well over 6,000 years old by the time of the events described in The Lord of the Rings. Elrond’s twin brother was Elros Tar-Minyatur, the first High King of Númenor. Although Elrond was considered half-elven, that was not meant to be an exact percentage value; he and his brother Elros were also descended from the Maiar, angelic beings who had come to Middle-earth thousands of years before. Elrond, along with his parents, his brother, and his children, were granted a choice between Elven or human fates by the godlike Valar. Elrond chose to travel into the West and live as an immortal Elf, while his twin Elros chose mortality. As documented in The Silmarillion, Elrond was born at the refuge of the Mouths of Sirion not long before its destruction by the sons of Fëanor. He and his brother, Elros, were captured alive. Their parents feared that they would be killed, but instead they were taken up by the brothers Maedhros and Maglor. Elrond went to Lindon with the household of Gil-galad, the last High King of the Noldor, when Beleriand was destroyed at the end of the First Age. He chose (like his parents but unlike his brother) to be counted among the Elves when the choice of kindreds was given to him. According to the appendices of The Return of the King, Elrond was Gil-galad’s herald in the Second Age. During the War of the Elves and Sauron, Elrond was sent to Eregion when it was attacked by Sauron. He united his army with one from Eregion, led by Celeborn. Eregion was destroyed, however, and Elrond was driven back and surrounded by Sauron. Fortunately, an army led by Durin and Amroth assailed Sauron’s host in the rear, causing the Dark Lord to turn and drive them back to Moria. Elrond was able to retreat to a valley where he made a settlement at Imladris (Rivendell). In 1700 an army from Númenor arrived in Lindon and Gwathló, and Sauron was trapped between the Númenóreans and Elrond. The White Council decided that Eregion would be abandoned in favour of Imladris. Upon this occasion, Gil-galad entrusted Elrond with Vilya, the mightiest of the Three Rings of the Elves. Near the end of the Second Age, the Last Alliance of Elves and Men was formed, and the army departed from Imladris, led by Elendil and Gil-galad, who were both killed in the Siege of Barad-dûr. Elrond and Círdan were the only ones to stand by Gil-galad’s side when he fell. In the early years of the Third Age, Elrond married Celebrían, daughter of Celeborn and Galadriel and his second cousin twice removed. The union produced twin brothers Elladan and Elrohir, and a daughter, Arwen Undómiel. 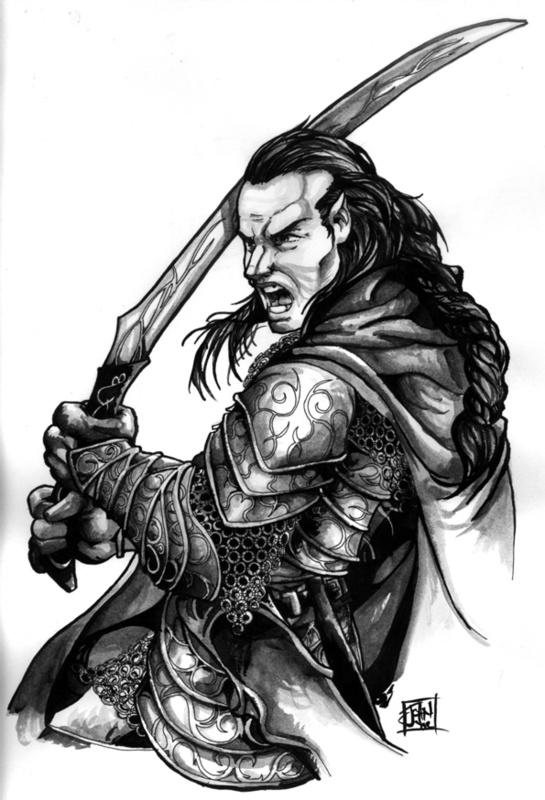 During the Third Age Elrond was the main ally of Arnor. Following its fall, Elrond harboured the Chieftains of the Dúnedain and sheltered the Sceptre of Annúminas, Arnor’s symbol of royal authority. After being captured and tortured by Orcs in the Redhorn Gate, Celebrían left Elrond and went over the sea to seek healing. After Aragorn’s father Arathorn was killed a few years after Aragorn’s birth, Elrond raised Aragorn in his own household and became something of a surrogate father to him. Aragorn was also Elrond’s far-distant nephew (removed by sixty-four generations), being the descendant of Elrond’s twin brother Elros. In The Hobbit, Elrond gave shelter to Bilbo Baggins’s party, after which, presumably, the two became friends. He received Bilbo as a permanent guest when the latter left the Shire some 60 years later. In The Fellowship of the Ring, he headed the Council of Elrond, at which it was decided that the One Ring must be destroyed. Elrond remained in Rivendell until the destruction of both the Ring and Sauron in The Return of the King. He then travelled to Minas Tirith to see Arwen marry Aragorn, now King of the Reunited Kingdom of Arnor and Gondor. Three years later, at the approximate age of 6,520, Elrond left Middle-earth to go over the Sea with the Ring-bearers, never to return.